Model IT950IC Mackissic International model walk behind roto-tiller. Heavy steel frame, designed for rental use. Has high-torque rental quality transmission with heat treated sprockets and grease bath lubrication. Tiller tine shaft is 1 1/4 inches in diameter and case hardened, ground, and polished carbon steel. Standard tiller tines are all welded slasher style tines. 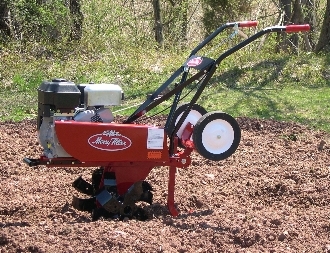 Drag bar for height adjustment is standard, as well as a heavy-duty one piece hitch with non-slip settings to accomodate tilling accessories. wt. is 160 lbs., unit ships by truck.